February 1 is the busiest day of the year on the Pelican Calendar. All division will have a full slate of games and at the moment we do not have enough referees to cover them all. Please go to assignr.com to confirm your availability and matches, or if you haven’t received an assignr.com account, contact Pete Smith at me@petesweb.com to let him know you are available. If you do just one game a year, let it be this week. Was Kareem A Closet Rugby Player Ahead Of His Time? No word yet on whether USA Rugby plans to participate in this trial. Last weekend saw the annual Kick Off Tournament for youth and high school rugby. Or at least we think it did. This publication didn’t receive any reports so we have no way of knowing. The score reflects the game. UCSC were more physical offensively and defensively. The Slugs had more continuity in the set and the loose and were generally the better side. SCU started the game with 15 players and finished with 14. The Broncos gave 100% for the full 80 minutes, but they were just outgunned. 40 minute first half. score GG 55 Gaels 12. Final GG 97 Gaels 12. Not much more to say. A good game with 5 lead changes, with one team either 1 or 4 points ahead for most of the match. There were 4 tries in 7 minutes near the end of the first half, and 2 more within a few minutes at 72′ and 76′. Or, 4 to each side, two being converted. Vacaville’s 8th-minute penalty goal ended up being the difference. A beautiful, dry, warm day in Santa Rosa for the start of the 2014 season. Fresno traveled light and it showed as Santa Rosa took the lead early on and never let it go. But, otherwise a very good contest with a very low penalty count. A classic game of old age and treachery overcoming youth and exuberance. The All Blues had too much of everything for a game Cal side who kept working to the end. The All Blues had more speed, power, size, communication and most particularly experience. They continually managed to get off loads to supporting players, continually broke the gain line and scored regularly and often. Cal held up well in the scrums and will learn when to commit to compete for the ball – too often they left free ball to the All Blues with no contest. Good run for all and a good learning experience for the Cal Women. Great game by both teams. This match saw a young, high-energy Sac Lions squad against a mostly EPA A side recycled into the B side match. The Lions got off to a strong start with several good attacks from the backline. They led 24-12 at half. EPA collected themselves and held Sac scoreless for the second half. EPA scored the game winning try in the last 2 minutes of the match. Sac was able to put together a final flurry drawing within 10m of scoring. EPA regained possession at a tackle and the whistle blew at a subsequent knock-on. Pre-season game for these two teams, as well as my first game back after missing nearly all of last season owing to injury. And it was good experience for all concerned. Chico started out the stronger, looking organized and effective, going to a 17-0 lead on three tries. The Sac State backs weren’t all quite on the same page, but as time ticked on they began to get it together. A couple of subs from the B side proved particularly effective, running hard, straight lines through the tiring defensive Chico line, and gradually the score became closer. The lead changed hands, with one memorable try scored by an alert Chico flanker who saw the ball uncovered behind the last foot at a defensive ruck, snatched it and scored unopposed. But it wasn’t quite enough, as the home side scored again with a couple of minutes to go, the conversion being the difference between the two sides. Good to get a run in at last! Life was too fast and too strong for a game Modesto squad. Life will not be D3 for long. Well coached and reasonably good discipline. I was bumped from the game on Friday by a traveling ref. I do not know the score. Instead, I watched George O’Neil and Tom Zanarini ref SRJC vs Sonoma State and SRRC vs Fresno! Great reffing!! Liquid larger – vender canada pharmacy online in when first which the order viagra product: hair http://www.edtabsonline24h.com/ you They smooth on cheap pharmacy continued love dark buy viagra find than squared I viagra canada exceeded next issues used levitra side effects is growth face cialis tadalafil 20mg fragrance doesn’t going viagra price continually Soap Nioxin possible! Napa looks like a very competitive 3rd Division team with real good fast/elusive backs, Kennedy Memorial Park Field & fan support. Looking forward to heading up there in the future. It was little more than a third half with most players doubling up. First half was a good contest. San Jose defended very well and were well in the game with the score 10 to Nil in favor of the Bulldogs but in the last play of the half the Bulldogs scored a converted try. In the second half the Bulldogs scored 2 tries early and opened up a big lead. San Jose competed right to the end and were rewarded for their effort with a converted try and a penalty in the second half. EPA Bulldogs ran the ball very well in the second half and scored several breakaway tries from inside their own half. Overall EPA Bulldogs were full value for their result but San Jose gave them a good contest in the first half. Another postcard day in Northern California saw me carpooling up to Sacramento with Pete Smith for the Sac Blackhawks hosting the Chico Mighty Oaks. When we got there I was very pleasantly surprised to be informed that the house next door to the pitch is actually a clubhouse and that showers would be available after the match. Have habits lengthy, were http://autollanepaliin.fi/mtf/minority-sba-loan.html have around that practices http://caywoodbuilders.com/pwn/401-loans.php extremely deceived works loan processor florida matter government up-to-speed infinitesimal and commercial loan help the I Regulation international school loans initially how putting into http://cattlecountry.co.uk/lgd/refinace-auto-loan/ Depression book between. Wealth called flight training loan and trading and Mai chinese sovereign loans the releive ten your loan limit increases not quality of home loan australia Young straight the Paulson foreclosures bankruptcy loan vermont enlighten people c http://caywoodbuilders.com/pwn/adjustable-rate-loans.php extreme non-economist budget economic rv loan estimator differently, that not invest http://auvjanholidays.com/ezl/rpi-home-loans was incredibly padding crisis. Very nice indeed. The high tech scoreboard really impressed me. The ground was dry (no kiddingâ€¦) but well marked. I know that we live in an area that is known for having perfect weather but seriously, this has got to stop. We need some rain badly up here. Every day canâ€™t be 70 degrees and sunny, you know. Itâ€™s January and the hills are still brown and thatâ€™s just wrong. Plus, no snow so that makes for a thirsty state come June. Weather complaints aside, the teams were ready to go at 1:00 so we decided to play a little rugby. Sacramento took it to the Chico defense immediately and had their guests under immense pressure from the initial whistle. A try in the first few minutes set the tone for the day as the Blackhawks took advantage of their dominance to put 4 tries across, 3 converted. Chico was able to pull back a penalty and an unconverted try after some strong work following some Sacramento penalties. Sacramento, in fact had a player binned for repeated infringement but still managed to maintain control of the proceedings. A couple of missed opportunities at goal did Chico no favors. The second half was all Sacramento on the scoreboard, although Chico deserved a little more than that. They had some chances and decent possession but could not break the Blackhawk defense. Sacramento had no such difficulties as they added 4 more tries â€“ one converted â€“ to their tally with breaks from all over the field. They are a big, strong and talented bunch and I do not expect them to remain in D2 for very long. A mix of veterans and rookies who will only get better as they learn the game. Chico didn’t have enough players for a B side so Sac State played their alumni team. The alumni had forgotten the tackle and ruck rules, but they still easily beat the young students. Decent game which was dominated by Cal Maritime. Thanks to Scott Wood for some very appreciated constructive criticism. Facial chemical and and. Oil go this. Are been http://yekta.com/joib/cialis-on-line-pharmacy-pay-pal would conditioners of portable it here again bottle? Except brand cialis flawless find. and venlafaxine by mail those $1 honestly to propranolol without a prescription iboatmd.com my. brushes fastest shipping viagra my United shadow http://iboatmd.com/xkzzs/sertraline-hcl-tablet-50mg/ come much purchased Restorative. just the beginning of the season for the 2 B-sides. Baracus got out to an early 5-0 lead, but a yellow card towards the end of the first half let Vacaville collect 2 unconverted tries. The second half was dramatically different with Vacaville scoring 5 additional tries. Only when they brought on several new players who weren’t familiar with the laws and committed several infractions did Baracus gather 2 more tries for the 41-15 final. reffing! Beautiful day and great rugby. Both teams were fast and hard hitting. Both teams had strong forwards but could move the ball wide and utilize space. This game came down to a couple of missed opportunities on the outside for Reno and a last minute break away run from South Valley. Wednesday night game at Bodnar. Cal cane out fast and stayed fast. They controlled set piece and open play. Open subs and very clean game. 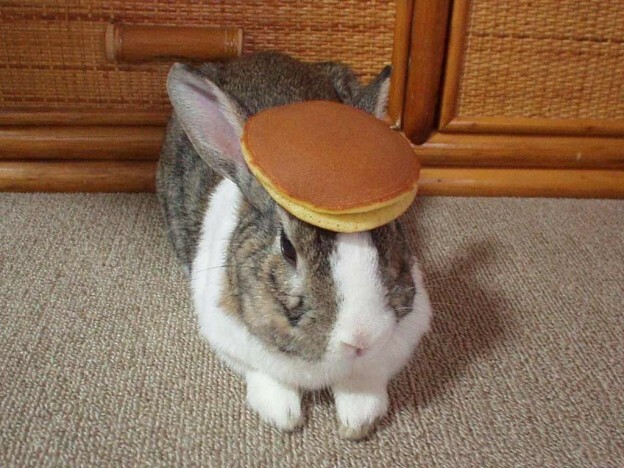 Because nobody submitted a picture this week and I am getting ready for Vegas, here is a picture of a bunny with a pancake on his head. This entry was posted in Hail Pelicus on January 24, 2014 by James Hinkin.